MCFAs are channel directly to the liver and converting into energy; now the body gets a boost of energy. This burst of energy has a stimulating effect on the entire body. They can be used by the cells or organs for energy or stored in adipose tissue or dropped off on the sides of arteries, etc. The fats which do this are cholesterol, long chain saturated fats, monounsaturated fat, and polyunsaturated fat. The body develop a resistance to insulin as they get older and it becomes increasingly more difficult for the body to get these molecules into the cells. Triglycerides and the lipoproteins, in the same manner as glucose, travel across the cell membrane to be used as energy, and they too require enzymes as carriers in order to permeate both membranes of the cell's mitochondria where their energy is released. Fatty acids help keep the skin healthy, prevent early aging, and promote weight loss by helping the body process cholesterol. 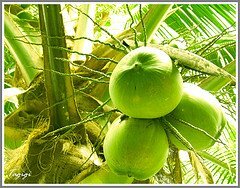 More importantly, they help to get rid of the arteries of cholesterol build up"
Metabolism with coconut oil produce energy. Other dietary fats produce fat.